While movie studios the world over scramble to create their own answers to the cultural/financial juggernaut of the Marvel Cinematic Universe, M. Night Shyamalan, the much-beloved, often-maligned creator of highly personal and unapologetically idiosyncratic thrillers, has managed it on his own, entirely. Shyamalan has finally completed his Eastrail 177 Trilogy, nineteen years in the making, begun in 2000 with the brilliantly-deconstructive superhero drama “Unbreakable” (2000), one of the rare films that even his detractors begrudgingly applaud, and continued in 2016’s with the slasher “Split” (2016). The road to “Glass,” the trilogy’s capstone, has been the stuff of Hollywood legend: after a series of embarrassing flops leaving him the laughingstock of American cinema, he self-financed his comeback, the commercial and critical hit “The Visit,” 2015. When the twist ending of his follow-up “Split” revealed it existed in the same universe as “Unbreakable,” audiences went mad with expectation, hoping that the man once proclaimed as Spielberg’s successor had gotten his mojo back. What a pity, then, that “Glass” is such a patently absurd bit of self-indulgent nonsense. After getting captured in the middle of a fight, super-powered security guard David Dunn (Bruce Willis) and Kevin Wendell Crumb (James McAvoy), a serial killer with dissociative identity disorder, get sent to a Philadelphia mental institution run by Dr. Ellie Staple (Sarah Paulson), a psychiatrist specializing in patients who believe they have super powers. Also kept in the institution in a state of constant sedation is Elijah Price (Samuel L. Jackson), a self-proclaimed super-villain named “Mr. Glass” with genius-level intellect and a genetic disorder that makes his bones extremely fragile. 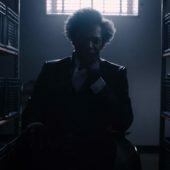 The movie sees Mr. Glass breaking out of the institution, freeing Crumb (a.k.a. ‘The Horde’), and forcing Dunn (a.k.a.’The Overseer’) to accept his role as a superhero and reveal himself to the public by stopping them. It’s all ridiculous, poorly-contrived rubbish, heavy on pedantic monologuing and weak on sense. Yet what the film lacks in sanity and formal brilliance–“Glass” is Shyamalan’s most stylistically-dull film in years–it makes up for in charisma and enthusiasm. The third act is the most explosively courageous outing by a Hollywood studio since Darren Aronofsky’s “Mother!” (2017). If only more American movies cared so little with pleasing middle-brow audiences—it shoots for the stars, misses, and careens on towards galaxies most filmmakers don’t know exist.